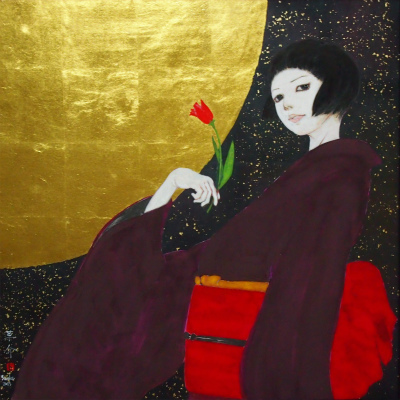 Souske Onoike Japanese artist, describes the traditional beauty of his country of origin. For the past few years he is focused on kimono, which is at the center of the scene and expresses the beauty of young virgins. With a foundation in traditional Japanese painting techniques, he like to add a twist to the works, making them accessible to foreign audiences. He feel grateful if his audiences are able to feel even a little of the essence of true Japanese beauty in his work. 2010 Tokyo · "4th GINZA de ART"
2011 Sydney · Tom Dunne Gallery "Art Collection Sydney 2011"
Tokyo · ART BOX GALLERY "Contemporary Art Exhibition 2011 Art Style"
2013 Florence · "International Art Exhibition in Florence"
Osaka(Japan) · "SNIFF OUT 2013"
Melbourne(Australia) · "AN Esplosion of Contemporary Japanese Art"
SOUSKE ONOIKE is an artist who with his paintings give us a little bit of glamour and essence of his native earth, Japan. Through a black precise but sinuous sign, female figures of delicate and refined beauty take shape, wrapped in the traditional kimono. The feminine fascination power is used not in mischievous or instigating way, but as symbol of a fine and chaste sensuality; of a beauty almost whispered, which we can behold implicitly in little gestures and elegant poses, in the sweet and shy glances, in the delicacy of the chromatic harmonies.